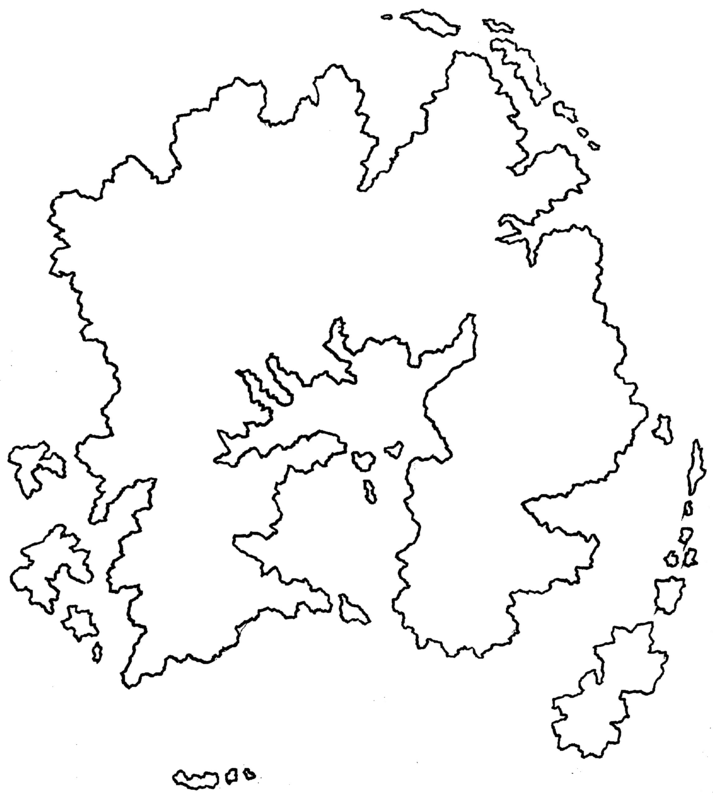 Back in December of 2015, I spent part of an afternoon with a pen and paper and sketched the outline a continent. A few days later, I decided to run a campaign – but as soon as possible which meant using an existing campaign world. So I put the campaign map aside and concentrated entirely on how to get a campaign up and running as quickly as possible. The vague initial notion while sketching the outline was that this would be a world so dominated by large, nasty sea-going creatures that the only feasible naval activities would be in the shallower inner sea. Nations would crowd around the smaller but far safer body of water and conduct trade, war, and it would be awash with the activity of the civilized races. Needing mapping tools, I first purchased NBOS’ well regarded Fractal Mapper 8. It is powerful enough and has a lot to recommend it. I like a great deal it for dungeon mapping and battle-map creation, but I don’t care for the overland mapping. It is too…fiddly for my needs. You could (and I could and did) spend a lot of time re-sizing and positioning map imagery. Then I looked at Hexographer and also bought it. Hexographer is down and dirty, far less functional than Fractal Mapper, but so clearly focused on a singular task that it is both easier to use and far more goal orientated. You can really blaze through world creation which, for my needs, is almost perfect. I wanted to hash out the rough outline of the campaign map with the intent of coming back and drawing the entire map by hand from the diagram that Hexographer allows me to create. 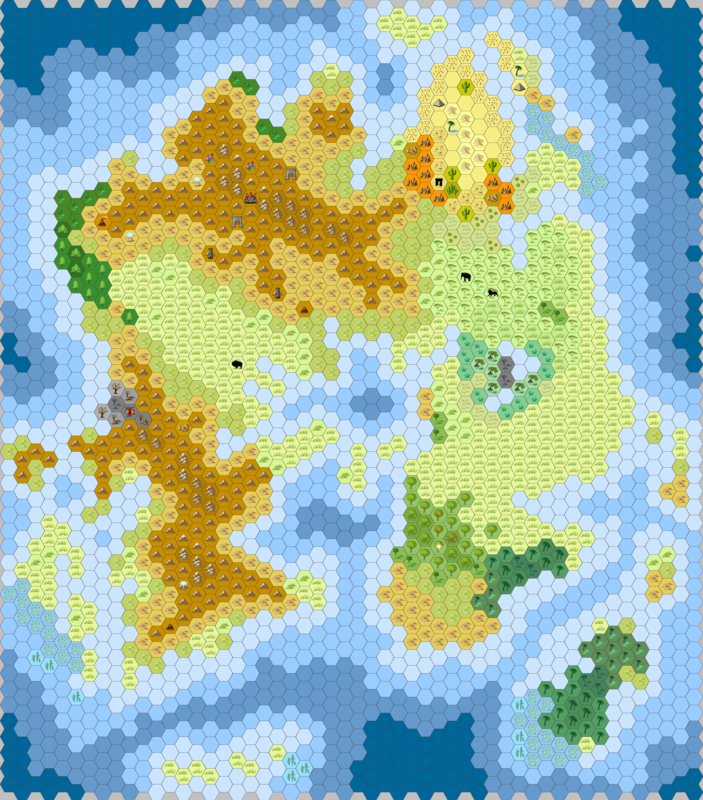 I’d have no problem GMing from the resultant Hexographer maps, but I’d greatly prefer to invest the time to create my own hand-drawn, highly emotive campaign map which will take a sizable investment in time and effort to create. You will note that it has no river basins drawn, virtually no towns, roads, trails or national markings. It will come – I need a little time to think on the lay of the land and how I want things to play out. Rivers make natural borders which is why it requires more than a little time to hash-out where all of the races will be located. I also did some checking and with a 36-mile hex, this landmass represents around 18-22% of an area the size of Australia. Not that huge, but large enough for my needs. I will add to this map and associated dialogue over the coming weeks and perhaps months. Humankind will be a young, low population race that relies heavily upon the good graces of the Elves. The Elves, being out numbered by races that are hostile to them and having a poor reproduction rate, are more than happy to have the fast-breeding humans acting as a buffer against their enemies. A social and political union of the Dwarf and Gnome will be the strongest non-evil force and neutrality will be well-represented. Greed and avarice will mark their goals and they will not be the best of neighbors as a result.